How can I duplicate a field or entire section? 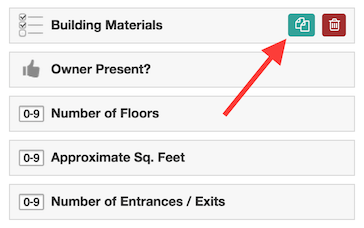 Learn how to duplicate sections or fields on Fulcrum apps. To speed up the app creation process you can use the duplicate button to duplicate a field or an entire section to a new one. This button, along with the delete field/section button appear when you hover your mouse over the field/section you wish to duplicate. You’ll need to make sure you modify the data names of the new duplicated section or field. The system does not automatically alter the data names for fields and data names are required to be unique to save the app's structure. When you duplicate a section, all of the fields contained within that section will also be duplicated.